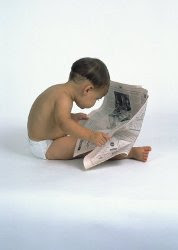 In Technical analysis identifying the trend is an important factor.The trend can be up, down or sideways. Trend Lines are an important tool in technical analysis for both trend identification and confirmation. A trend line is a straight line that connects two or more price points and then extends into the future to act as a line of support or resistance. Using trend lines as a tool to technically analyze the markets has been around for a long time and was originally also used by floor traders. A long line of past price ranges together gives you a pattern.There will be plenty of ups and downs along the line but you should still be able to discern a general direction up, down, or sideways. How to draw a trend line. The first consideration when looking at any market is the direction of the long term trend.Trendlines illustrate the direction of the market movement and provide a primary consideration in any analysis. Uptrends consist of a series of successively higher highs and lows. Drawing trendlines during an up trending market: The trendlines above have been drawn by connecting as many successive lows as possible (along the bottom of the price range). 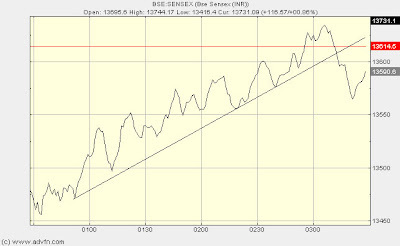 An up trending trendline represents major support for prices as long as it is not violated. Downtrends consist of a series of successively lower highs and lows. Drawing trendlines in a down trending market: Down trending trendlines are drawn by connecting as many successive highs as possible as shown above (along the top of the price range). A down trending trendline represents major resistance for prices as long as it is not violated. An important concept in the use of trendlines as mentioned above is that of support and resistance. A continued trend is based on underlying support for prices in the market, for whatever reason. Similarly, there is resistance to higher prices built into the market.The trendline is one way to capture and illustrate these zones of support and resistance. As long as the market stays within these zones of support and resistance, as shown by a trendline, the trend is sustained. 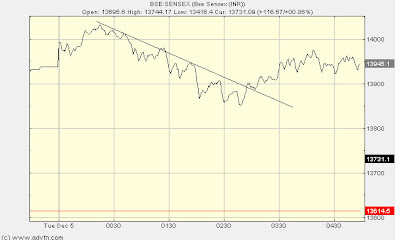 Any penetration through a trendline warns of a possible change in trend. We may not know the reason behind such a change, but we do know that for some reason the support or resistance for a market is changing. Trend lines can offer great insight, but if used improperly, they can also produce false signals. Other items - such as horizontal support and resistance levels or peak-and-trough analysis - should be employed to validate trend line breaks. While trend lines have become a very popular aspect of technical analysis, they are merely one tool for establishing, analyzing, and confirming a trend. Trend lines should not be the final arbiter, but should serve merely as a warning that a change in trend may be imminent. By using trend line breaks for warnings, investors and traders can pay closer attention to other confirming signals for a potential change in trend.